Participants will paint a mural so as to express themselves through art and music. See the below for detailed setup directions. 1. 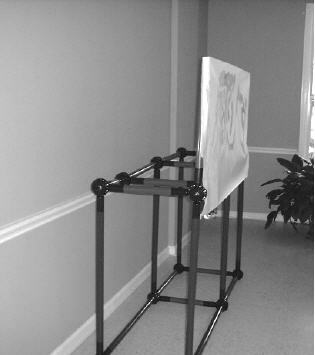 Start by constructing the base of the mural stand. Using spheres, two 36” and two 16” tubes, build the rectangular base. 2. Then, on the right side of the rectangle, add three more 16” tubes with two spheres to create the square part of the base as seen in the picture. 3. From each of the six spheres, extend one 36” tube vertically. 4. Attach one sphere to each of the ends of these vertical 36” tubes. 5. Working perpendicularly from the base’s 36” tubes, connect the spheres at the tops of the 36” tubes with three more 16” tubes. 7. Then vertically attach one 24” tube to the front far left and front far right sphere. 8. Finally, wrap these two vertical 24” tubes with craft paper as shown. Appropriate caution is important to conduct these activities in a safe manner. Be sure to review these reminders prior to beginning the activity, and if necessary, share reminders with the group if necessary. 1. Circle up the group. The National Association of Self-Expressive Arts has commissioned your group to paint a mural to be displayed at their annual awards banquet. Listen to the music and let yourself “feel” the art in you as you begin to paint. This is about self-expression, so there are no rules. Just paint with the music. Enjoy! 3. Read aloud the following Activity Challenge Box to the group. Activity Challenge: Participants will paint a mural so as to express themselves through art and music. 4. 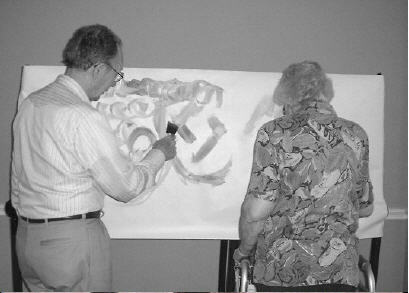 Select calm, relaxing music and allow the participants to paint according to how they feel. 5. If your group is struggling, or if you feel your group would benefit from an additional challenge, present a variation provided below. 6. After the activity, move to the “Activity Discussion and Processing” section. 1. Use different types of music. Throughout the group, try jazz, country, easy listening, or golden oldies and see if the mood of the group chances and if it influences the art. 2. Participants create their own art. Rather than as a group, mark off areas for each person to have their own space to create their own art. 3. Paint with a theme. 4. Family or intergenerational activity. Use this activity as an intervention with family members. You can also set it up on Grandparent’s Day in September and have the grandchildren paint their handprints or their names on the mural. 5. Paint with your eyes closed. For a different sensory experience, invite individuals to experience painting with their eyes closed. 6. Paint with your non-dominant hand or feet. Have participants try painting with their non-dominant hand or, if they are really ready for a challenge, lower the paper and have participants paint with their feet! The effectiveness of the group process will often determine the outcome for the participant. These are only suggested questions to begin the discussion. Select the ones you feel will best benefit your group. Make sure to let everyone share their ideas, and remind participants that everyone’s feelings are important! How did you feel when you heard we were going to paint? Did the music influence your mood? What was the most difficult part of this activity? Have there been activities that you have been afraid to do in your life? Was being with your friends meaningful? What were some of the barriers you faced during your participation? Here are available Training Options! Vicky Pitner is the author of the Toobeez Senior Therapy Activity Workbook and the upcoming Toobeez Recreational Activity Workbook. Recreation Services provides therapeutic recreation consulting, program development, staff and respite training, inclusion training, and workshops.